Noodles, in many forms, have been a staple food in many parts of the world for centuries. China, Japan, Italy all take credit for creating the noodles. However, the earliest records appear in a book written between AD25 to 220 in China. No matter the origin, noodles have been a staple food, relatively cheap, quick to prepare and filling. Somehow, the Italians have fostered the use of pasta in many forms and therefor many think that pasta is Italian. Here is my Noodle Dough Recipe. 1. Place eggs, water, oil and 4 cups of flour in mixing bowl. Use the dough hook, and mix for about 2 or 3 minutes. Add additional flour if needed to make dough firm and pliable. 2. Remove the dough, place on floured board and knead with the heel of your hands, for about 2-3 minutes or until dough becomes very smooth. It should not be sticky, If so , add flour until fingers come away clean. 3. Wrap the dough ( saran wrap) and let rest for an hour at room temperature. 5. Take one piece at a time, flatten into a rectangular shape, either with hands or rolling pin, adding flour on both sides as needed. 6. Run dough thru pasta machine, fold and repeat. Continue passing the dough thru the machine rollers, closing down the rollers with each pass until you have the desired thickness. 7. 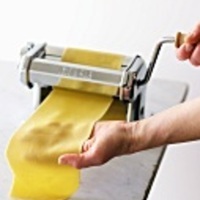 Run the pasta sheets thru the blades of your noodle machine, and with the left hand, hold on to the pasta as it comes thru the cutters. 8. Place cut noodles on floured linen kitchen towel, allowing them to dry or until ready for use. You can also hang the noodles over a suspended coat rack etc. When ready to cook, shake off excess flour and place in boiling water, cook for about 3 or 5minutes al dente. Sounds good. Probly good with soups too.